Flexible OCR module for Goobi & Co.
Ruleset configuration for Goobi & Co.
Goobi’s core task is to manage digitisation project workflows. A workflow is a combination of several different steps. In the case of retro-digitisation, this may, for example, involve many relatively short tasks performed by a number of people with varied skills in an established order (cataloguing, scanning, image post-processing, producing derivatives, capturing structural data and metadata, archiving, etc.) Goobi’s role is to coordinate all those involved and thus ensure that all the work is carried out fully, accurately and in the right order. Many institutions that are heavily involved in digitisation have observed that different projects and materials require completely different approaches. The structure of a workflow also depends on the form in which the digitised material is to be made available. Many digitised texts are published on websites (e.g. using the Goobi viewer). Other materials might be digitised to order for delivery to a server operated by the client (e.g. web services, SMB, FTP, WebDAV). 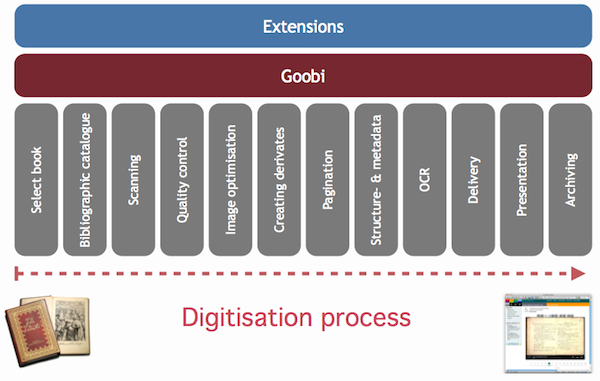 Goobi caters for every possible scenario, whether the material is to be digitised on site or is actually supplied in digitised form. Many digitised texts are subsequently processed using a full-text recognition program (e.g. the intranda OCR Service). For some works, it is sufficient to import bibliographic data from library catalogues, while others require the user to index structural data and metadata. For almost all projects and materials, however, the aim is to produce consistent results in a standardised form (e.g. METS / MODS or LIDO as the metadata format). This makes it possible to pass the data on to any other systems that are equipped to handle recognised standards.